The 2009 Genesis is Hyundai’s first full size rear-wheel drive luxury car. Its V8 engine has dual intake runners and variable timing on 32 valves. The South Korean automaker reports the Genesis can use both premium and regular fuel. K&N has released a replacement air filter (33-2426) for the 2009 to 2016 Hyundai Genesis with a 4.0 liter V8 engine. This washable, reusable panel K&N air filter was designed as a simple performance addition that also provides outstanding filtration. This filter can go up to 50,000 mikes between cleanings depending on driving conditions. K&N air filters are made from cotton instead of paper and never need to be replaced. K&N air filters provide less restriction than typical paper air filters which can increase the efficiency of the combustion process, creating more horsepower and torque. The simple drop in design allows the 33-2426 to simply fit in the factory air box. It comes with the famous K&N Million Mile Limited Warranty and will be the last air filter you will need to buy. There is a great deal of engineering behind every K&N air filter. Hand made in the USA using only the finest material, K&N uses independent laboratories to help ensure that our products meet or exceed your high filtration demands. We also conduct our own testing at our state of the air in house testing laboratory. 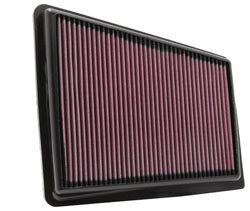 K&N is dedicated to providing first class air filters to vehicle owners around the world. Use the K&N application search to find all K&N products for your ATV, motorcycle, or vehicle then use the K&N dealer search to find a K&N dealer near you.